I remember when How I Do dropped. It was Black cool on another level. “Golden Boys” was the joint— Res with all that sass pulling down the curtain on all the men trying to play like Oz. And my hands-down favorite– “Tsunami” with its laid back, Caribbean beach-at-dusk vibe was the perfect groove for her vocals to glide. Black cool on a hot grrrl level. But then unbeknownst to most of us, there were hiccups and disruptions happening behind the scenes and Res was no longer on a major label. But she was still major. Shape-shifting activated in the form of an independent artist and with that Res released her Black Girls Rock! project, which was a collection of unapologetic, truth-telling songs about being a new millennial Black girl. She shape shifted again and this time it was in the form of a group called Idle Warship– her twosome with hiphop fave Talib Kweli. Their album Habits of the Heart went further left than the Fugees ever traveled mixing hiphop with punk rock, soul and electronica. And now with her latest project ReFried Mac, a dedication to Fleetwood Mac’s vocalist Stevie Nicks, Res channels Nicks putting her own unique stamp on five of her favorite Fleetwood Mac songs. Her versions have a twist of Blondie with a sprinkling of Donna Summer seasoned heavily with Tina Turner– Nut Bush Tina! What I love most about Res is she ain’t ever going out like that! When many other vocalists would fold and leave the table with whatever chips they had left, Res instead goes to the next table, tries the slots or eff it, Res goes all-in and risks it all because at the end of the day, Res’s music career is about being all-in, it’s about going hard or going home and clearly for this Philly native home is making good music on her own terms. 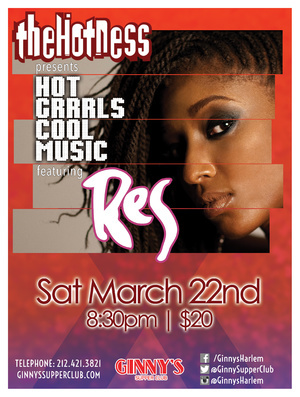 Please join me for the re- launch of my Hot Grrrls Cool Music series and check Res out Saturday evening, March 22nd at Ginny’s Supper Club located downstairs @Red Rooster in Harlem. It’s not that often that Res does a full solo set in NYC so this is a rare opportunity to catch this ever-budding vocalist and you may even get a sneak peak of her soon-to-be released CD “Reset.” You know this is not to be missed so be there!